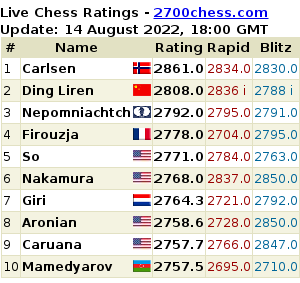 Shipov was again writing for the Chess-News website. The photos were taken from the ChessVibes report on Round 4 and the excellent photo reports at the official website (Anna Burtasova), and Chess-News (Evgeny Surov). After Shipov’s round-up there’s a board on which you can play through all the games (tip – you can use the arrow keys to go backwards and forwards). The clearest moment: instead of 23. Rd1 there was the very strong 23. Rhe1! with two ideas – to free the bishop on b5 via e8, and also to play Re6-e7xg7! and then infiltrate with the second rook on e7 with a mating attack. In general, he didn’t manage it, he couldn’t cope. And rightly so! 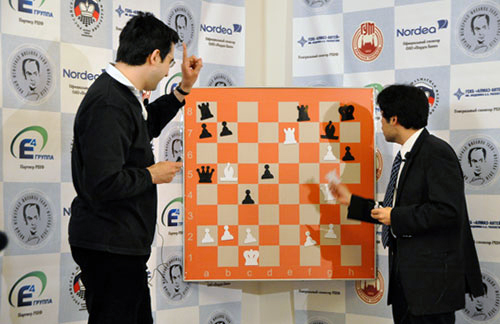 You can’t do anything but admire the play of the Armenian grandmaster. It’s even hard for a commentator armed with a powerful computer to find flaws in what he did. It seems that White had an edge, but Black very deftly and, above all, cleanly simplified play and brought the game to an equal ending. 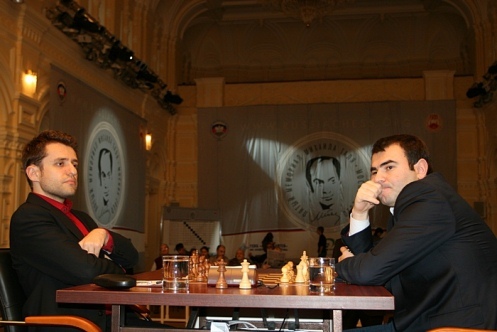 Mamedyarov’s got nothing to reproach himself with. He did everything he could (finding minor but non-critical subtleties in analysis doesn’t count), but the drawing tendencies of the position proved great. The result was 100% logical. In this game, meanwhile, the swings in the evaluation of the position were enormous. Coming out of the opening Grischuk, in my opinion, was in too much of a hurry to break up the centre with the move 18…c5. After 19. Nf3 cxd4 Gelfand could have taken advantage of the pieces lined up on the d-file by playing the elegant combination 20. Nxd4! Nbd7 21. e5 Nd5 (or 21…Nh5 22. Be3 Nxe5? 23. Nxe6 Qa5 24. Rd5!) 22. Nxe6! fxe6 23. Nxd5 exd5 24. Rxd5 and when the d7 knight falls the situation becomes clear. After the restrained 20. Rxd4, however, Black successfully managed to untangle. The last chance to fight for a win was 27. Nh4 (instead of 27. a5) 27…Bxd6 28. Nf5, but analysis there shows that it turns out equal – and moreover almost all of Black’s moves are forced. Sasha, I’m sure, would have found them. Fortune finally smiled on the tail-enders, despite everything having pointed to both Shirov and Eljanov losing yet again. But they survived! Alexei Dmitrievich painstakingly recalled known theory at the board, while Sergey (still not Batkovich*) moved quickly and confidently. By the time the novelty came (23. Nd5 instead of the previously-played 23. Rad1) White’s advantage on the clock had become huge. Unfortunately for Shirov, Black’s position was also far from pleasant. Essentially White just had the technical task ahead of him of converting being up an exchange. For a time, to a point, Sergey conducted the game very confidently, but he couldn’t conduct it to a win. Instead of 39. Kxh4 he should have chosen 39. R7xd6+ Bxd6 40. Rxd6+ Kh5 41. Rxa6. It’s likely that the Russian was afraid of the line 41…Bc4 42. Rc6 Bf1+ 43. Kh2 Kg4, but you have to keep going: 44. a4 Kxf4 45. Rxc3 Ke5 46. a5 – White’s outside passed pawn is very strong, while Black’s pawns would gradually crumble. White would apparently have won in this case. But back in the real world Black got enough counterplay to survive. It’s simply amazing that Pavel survived today! It was as if he deliberately chose a line in the English Opening that was unfavourable for Black (where Black had already taken a beating in the recent game Malakhov – Rodshtein) and then didn’t demonstrate any fundamental improvement. He got a solidly worse position (it was painful to look at the c7 pawn) and little by little he went about losing. 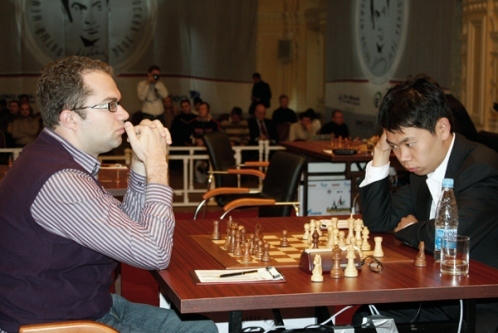 Wang Hao pressed according to all the laws of military art, and even the bold breakthrough 54…c6 (not to spend an age on the floor) in fact only speeded up… Black’s supposedly inevitable defeat. It would have worked out that way if White hadn’t got too clever and had immediately infiltrated with a rook into Black’s rear-guard with 57. Rc8! (instead of 57. Bd3) In that case he would have been able to get down to dealing with Black’s weaknesses, preserving the extra pawn on d5. In analysis victory inevitably follows, moreover with simple human moves. However, after the sacrifice of the d5 pawn White still had chances. For example, it struck me as promising to centralise the king with 60. Ke3 (instead of 60. Bg6) 60…Re5+ 61. Kd4 – and things are tough for black. While in the game Eljanov saved himself with the subtle nuances of a pawn ending. Well, such escapes are worth as much as other wins! 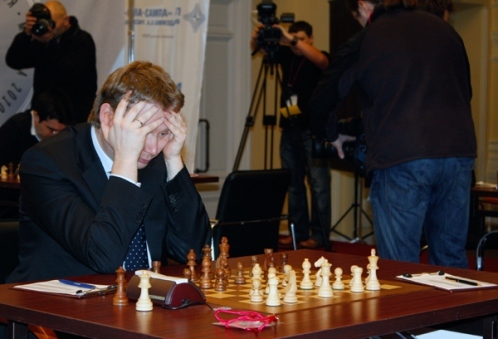 I really hope that after today’s exploits Alexei Shirov and Pavel Eljanov can perk up and start to collect points. Both need one win in a row, and things will get easier.